Over the last five or more years a drought of historic proportion has plagued much of Texas. In fact, the National Weather Service reported that 2011 was Texas’ driest year on record. Fast forward to 2015 and that’s hardly been the case over the last few weeks as a good portion of Texas has received more rain in the month of May than they usually receive throughout the entire year. Rainfall totals reported to exceed 20 inches have been pretty common. 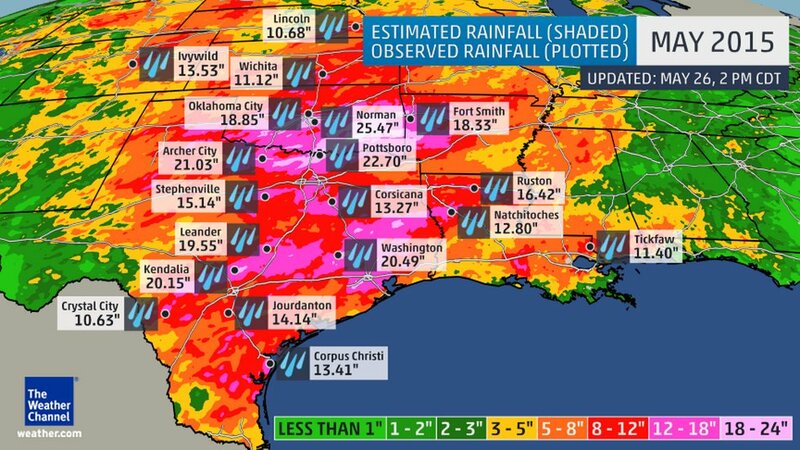 And to cap it all off, this past Monday a very significant rainfall event occurred throughout central and eastern Texas with more than 10 inches falling in Houston Monday night causing widespread flash flooding in the city. 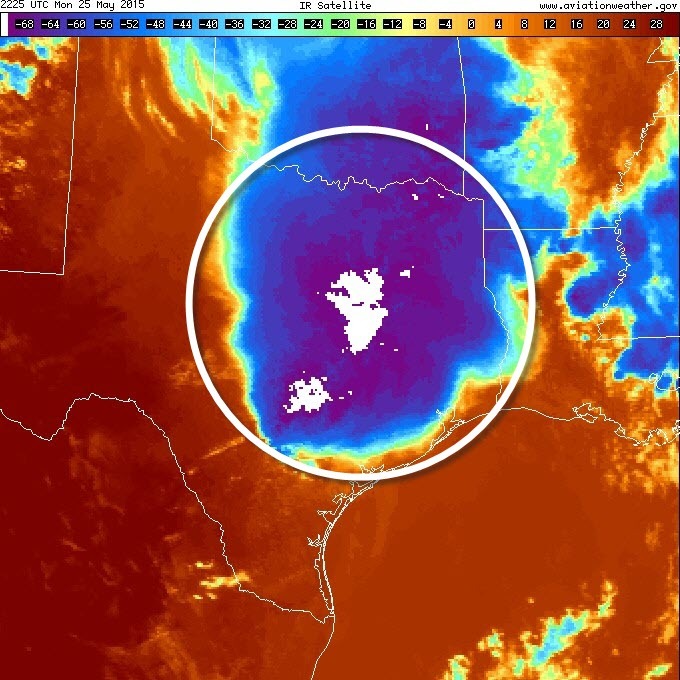 So what caused this extreme rainfall event? Rainfall totals in May 2015 for the Southern Plains and lower Mississippi Valley. Image courtesy of The Weather Channel. The phenomenon that was responsible for this deluge of rain on Monday is called a Mesoscale Convective System or MCS. Similar to hurricanes, they are very seasonal. Occurring mostly east of the Continental Divide, they start out in the Southern Plains and Deep South during the month of May. As the jet stream moves north through the summer months of June and July, they tend to occur in the Central Plains, Middle Mississippi Valley as well as the Tennessee and Ohio Valleys. Finally, into July and August, they are seen more in the Northern Plains, Upper Mississippi Valley and Upper Great Lakes regions. Many Mesoscale Convective Systems (MCSs) have a signature oval or circular cloud shield as seen on the color-enhanced infrared satellite image. This is the one that provided Houston with over 10 inches of rainfall in just a few hours. Mesoscale Convective Systems are easy to spot on the color-enhanced infrared satellite found in the ForeFlight Imagery as shown above. When mature, they usually appear as a large circular or oval cloud shield that can cover one or more Midwest states with very cold cloud tops that show up on this image as purple and white. Under this cloud shield is usually a bow-shaped line of strong thunderstorms at the leading edge of the MCS as seen on this NEXRAD mosaic below. Often an MCS will have a bow- or crescent-shaped line of echoes which is a good sign of very intense straight-line winds. You were probably taught that the early morning hours are the best time to fly to avoid thunderstorms. That’s usually sound advice unless you are dealing with an MCS that will often develop and mature in the overnight hours and persist into the next day. So they are often nocturnal beasts that almost seem to create their own environment to feed on. 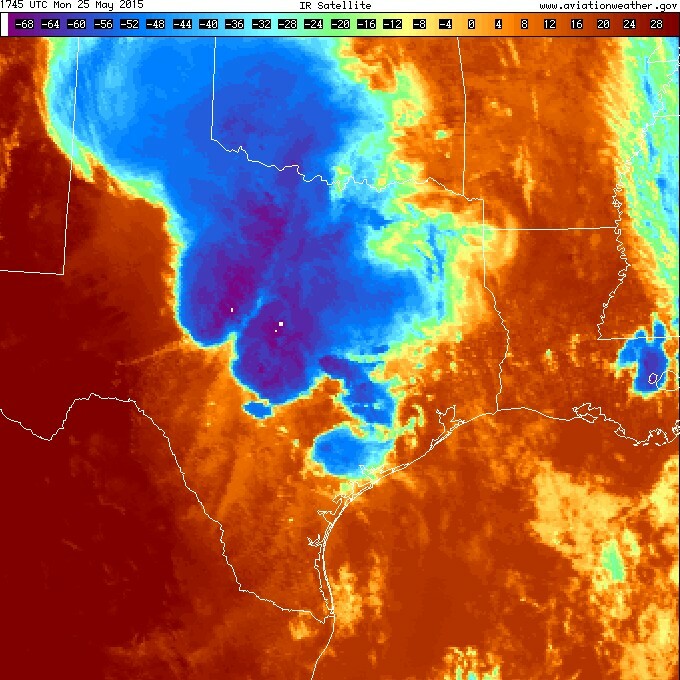 The weather system that dumped a copious amount of rainfall on Houston Monday night developed from a pair of thunderstorm complexes in western Texas early that morning. It’s unusual to see a pair of Mesoscale Convective Systems tracking along together. 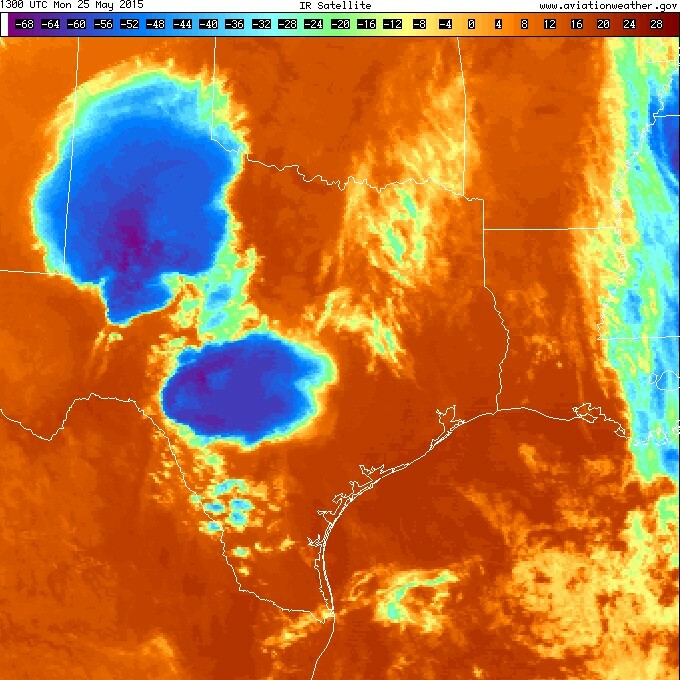 In fact, the MCS that flooded Houston Monday night was born early that morning in western Texas and began as a pair of MCSs as shown above. 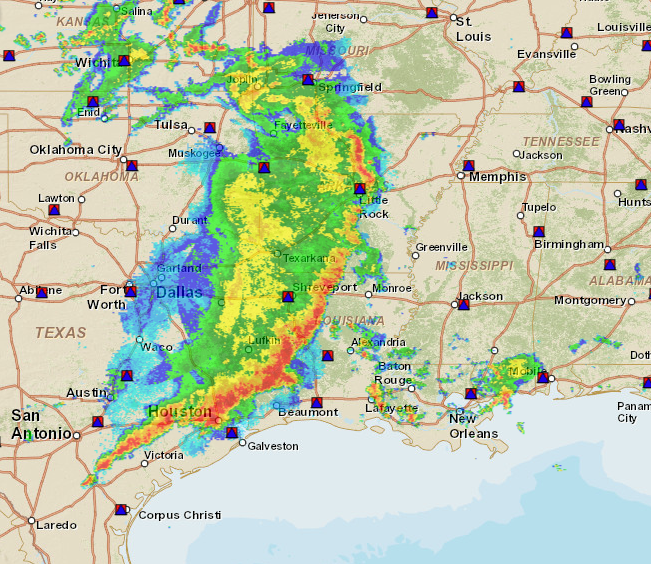 Throughout the morning the two systems tracked east and eventually merged (below) into a single complex of storms setting the stage for a very wet evening in Houston. Just after 12 p.m., the pair of Mesoscale Convective Systems joined up in central Texas to produce one massive convective complex. 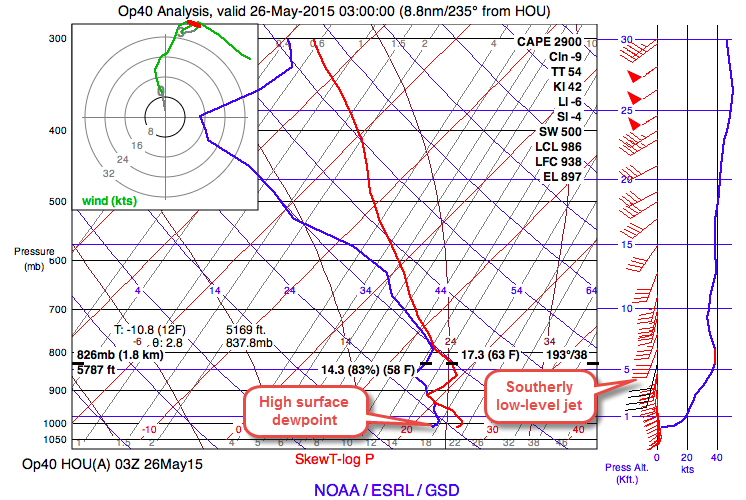 The Skew-T Log (p) diagram for Houston Monday evening shows the low-level jet as a maximum wind speed at 6,000 feet. This moist, southerly flow keeps the surface dewpoint temperature in the low 70s to offer a good source of moisture for the MCS to ingest. The Skew-T Log (p) Diagram is an excellent source to visualize the moisture, winds and the instability for a particular location. Last but not least, the Skew-T diagram shows the atmosphere was very unstable Monday evening with a lifted index of -6, Convective Available Potential Energy (CAPE) approaching 3,000 Joules/kg and a K-Index of 42. A K-Index this high is a good sign of high convective rainfall rates that can produce local flash flooding. This entry was posted in Weather and tagged aviation, foreflight, iPad, storms, Weather by Scott Dennstaedt. Bookmark the permalink.